Now that this sudden heatwave has hit the UK and summer has officially begun, I don't know about you but my pasty pale skin just isn't ideal looking when you're whacking out the shorts and dresses! However, if you're pale like me and are more likely to burn like a lobster in the sun than tan, it might be a good idea to fake it! I'm no pro when it comes to fake tanning, but after a lot of trial and error (and a few awkward streaky outcomes) I've found a few products and tricks to achieve a natural and gorgeous looking glow for summer! 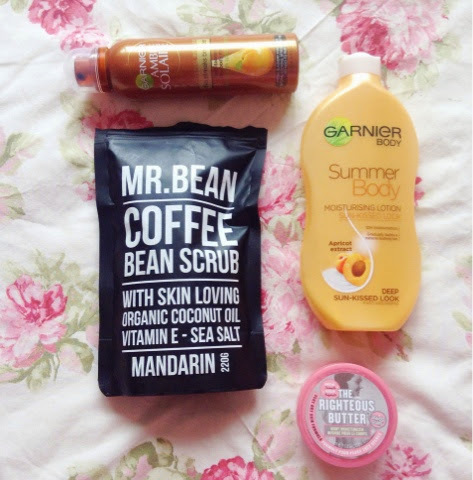 The first step that I've found to be pretty important to keep your tan streak free and smooth is to exfoliate before, and I love my Mr. Bean Coffee Bean scrub to do this, concentrating especially on dry patches like your elbows, knees and ankles, so the tan won't cling to those places and be a giveaway that it's fake! If you're going to be using a typical self tanner, like a mousse or spray, moisterising before hand is a must. 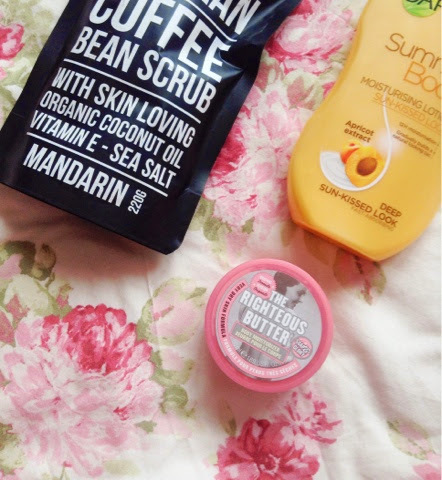 For this, I love the Soap and Glory The Righteous Butter to make your skin soft and get rid of the dry bits, so your tan will sink in evenly. When applying your tan, whether it's a spray, mousse or lotion, I've found it eky to apply it in slow, even and long strokes, especially important when doing your arms and legs. However, if you're still a bit of a newbie like me and want something not so in-your-face like a full on fake tan, a gradual tanning body lotion will be just the ticket! 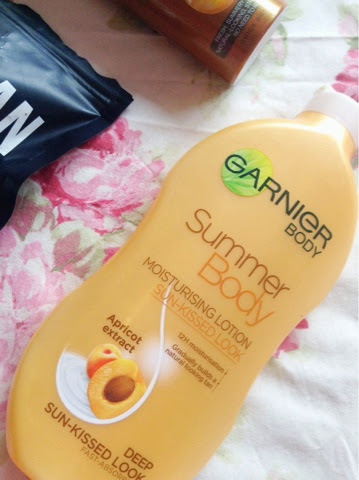 I use the Garnier Summer Body with long even strokes, especially up the arms and legs on summer nights after a bath or shower before bed, so I can wake up with a subtle bronze glow that isn't so obvious, but definitely makes you look a little sun kissed. Hope this has helped a little for fellow tanning novices, and have a fabulous summer, hopefully free of sunburn!